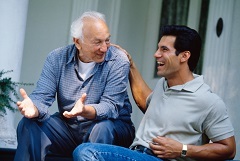 Discuss legal and financial matters, and long-term care. The sooner that you and your parents have this conversation, the better. You may think that this is an uncomfortable subject to bring up, especially if your parents are in excellent mental and physical health, but someday you will be glad that you had this conversation early on, before a health crisis may force you to do so. Unsure how to start the conversation? Ask your parents where they keep any life insurance policies, wills, advance directives for healthcare, tax returns, investment and bank records, and other important papers. Ask them who should be contacted in case they are in an accident or suddenly become ill and are unable to communicate. If they don’t yet have a will and advance directive, and have not yet given someone power of attorney, arrange to have them briefed by a knowledgeable relative or good friend of theirs, and offer to provide the names of local elder-law attorneys. When discussing the future with your parents, use open-ended questions that foster conversations about how your parents would like to see their twilight years play out, and how they think they should prepare. Offer options, not advice. Carefully listen to – not just hear – what your parents say, so that you can plan how to best accommodate their wishes while meeting their needs. Be understanding, and don’t treat your parents like children. For some seniors, realizing that he or she is no longer able to be in control of one’s life or to look after oneself can be a hard pill to swallow. Because there may come a time when a parent’s safety and healthcare needs outweigh the parent’s need for independence, it’s important to remember that your parents are not your children, even though it’s common for those two roles to switch at some point. If you start feeling frustrated or overwhelmed, don’t yell at your parents. Instead, be respectful of the fact that it may be just as hard for your parents to rely on you and ask you for help as it is for you to see your parents going downhill. How would you like to be treated, if you were in their shoes? Enlist other family members, seek support groups, and ask for help. By definition, parental caregivers tend to be sole caregivers. No matter how many children a parent may have, it’s not unusual that one child ends up as sole caregiver, and not necessarily by choice. Becoming a parent’s caregiver can have an isolating affect, leaving the caregiver determined to do the best job possible yet feeling exhausted and overwhelmed. Don’t be afraid to ask for help. Similar to advice that’s given to new parents, look for support around you. It’s okay to admit that there are limits to what you can do. If you don’t have siblings or other family members who are able to take on some of the burden, seek the help of professionals and senior-related resources, some of which may be not-for-profit or use a sliding scale for payment. If you don’t take care of yourself, who will take care of your parent?